The science of climate change is a complex subject that balances the physical record and scientific fact with politics, policy, and ethics - and is of particular importance to the geosciences. This thoughtfully crafted new text and accompanying media encourage non-science majors to practice critical thinking, analysis, and discourse about climate change themes. 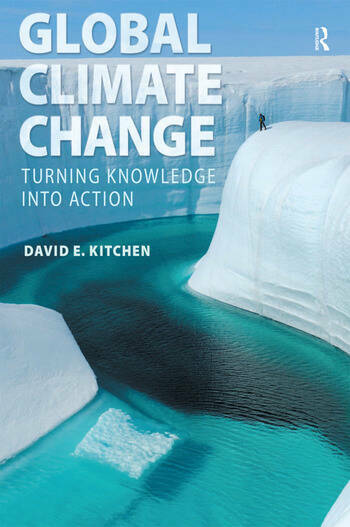 Taking a cross-disciplinary approach, acclaimed educator and researcher, David Kitchen, examines not only the physical science, but the social, economic, political, energy, and environmental issues surrounding climate change. His goal: to turn knowledge into action, equipping students with the knowledge and critical skills to make informed decisions, separate facts from fiction, and participate in the public debate. David Kitchen has a PhD in Geology from Queens University Belfast. After working for two years as a petroleum geologist in the North Sea, he started teaching Earth Sciences as a tenured member of the faculty at the University of Ulster, the largest of the universities on the island of Ireland. Following ten years of active teaching, research and research supervision, Dr. Kitchenâ€™s was promoted to the position of European Officer for the University with a major focus on international research and development. During this time he worked closely with the European Commission in Brussels, with particular focus on research policy and the EU Framework Research Programs. During this time he was also directly involved with grant applications for a number of environmental initiatives including higher education and government programs in Greece, Albania and Romania, and he advised on the development of a wide range of research programs involving collaboration across Europe and with the United States. Dr. Kitchen was then appointed to direct all international research and student programs at the university, and led the development of faculty research collaboration with Universities across the European Union, USA, Canada and Mexico. While focused on research administration during this period of his career, Dr. Kitchen continued to supervise research and teach geology as adjunct professor with the UKâ€™s Open University, working in both Ireland and England. In 2001 Dr. Kitchen moved to the United States to work at the University of Richmond. As Associate Dean and Associate Professor in the School of Continuing Studies he has responsibility for strategic planning for the School and directs all summer term academic programs at the university, both at home and overseas. He is also responsible for the development of a wide range of professional and personal development courses that reach out to the local community. At the University of Richmond, Dr. Kitchen teaches 3-4 courses a year on environmental geology, and has taught a course on global warming each summer for the past 5 years. He has served as representative on the Council of Environmental Deans and Directors, as Environmental Fellow for the Associated Colleges of the South, and as coordinator of university environmental programs. Dr. Kitchen was recently awarded a NASA education award to help develop a new course in global climate change. He continues to serve as an active member and interim chair of the environmental studies course team and serves on the University of Richmond sustainability working group and environmental awareness group. As a geologist, Dr. Kitchen brings an earth science perspective to the global warming debate, with specific skills in understanding and interpreting both ancient climates and climate change over geological time. His experience working with the European Union gives him a strong background in research practice and how science can be used to inform policy.